BIBLIOGRAPHIA IRANICA: Review: The Iranian Talmud. By Geoffrey Herman at AJS Review. ENOCH SEMINAR CONFERENCE: Early Islam: The Sectarian Milieu of Late Antiquity? / Fourth Nangeroni Meeting (2015 Milan), conference. It meets on 15-19 June, just before the regular bi-annual meeting of the Enoch Seminar at the same venue. I shall be at the latter, presenting a main paper, but I am sorry to have to miss this Nageroni meeting. Excuses for cross-posting. We call for applications to the manusciences '15 summer university organized by the Freie Universität Berlin and the Ecole pratique des hautes études on the beautiful island of Frauenchiemsee near Munich between September 6 and September 12, 2015. In presentations and practical exercises we will present the possibilities and limits in the application of CSI-style techniques from material sciences, imaging computational and digital humanities to manuscripts. MA students, PhD candidats, postdocs and colleagues from all countries dealing with any of the concerned disciplines or manuscript cultures may apply. We have numerous scholarships to cover the hotel and meal expenses. Deadline: May 26, 2015 (soon!). BIBLIOGRAPHIA IRANICA: Corpus Avesticum meeting: “Ḫorde Avesta.” A conference in Berlin which starts today, in which a group of specialists in a research network meet to discuss their work on producing a new, and much needed, edition of the Avesta. After Palmyra, Islamic State said to control half of Syria (AFP/Times of Israel). Vandals Paint Palestinian Flags Over Israeli UNESCO World Heritage Site (David Daoud, The Algemeiner). Inspectors from the Israel Antiquities Authority and the Israel Nature and Parks Authority filed a complaint on Wednesday with the Dimona police department over the vandalism at the ruins of the ancient city of Haluza, a UNESCO World Heritage Site located in the Negev desert. Haluza was one of four cities in the Negev on the Nabatean Incense Route. BOOK REVIEW: The authority of the written word (Rabbi James B. Rosenberg, The Jewish Voice). Earlier reviews etc. are noted here and links. Talmudic temptation (Linda Mothner, Jewish Journal). The Talmud also claimed a major presence in Anton’s earlier trilogy, “Rashi’s Daughters.” A former clinical chemist for Kaiser Permanente, Anton said that she never could have written “Enchantress” without first telling the story of the great scholar who lived in 11th-century France. The availability of historical documentation on Rashi helped greatly. Teasing out the basic information from just the Talmud about the characters in another book, “Rav Hisda’s Daughter,” was much trickier. I have linked to numerous articles on Maggie Anton's novels about late-antique Judaism: start here and here and follow the links. And I have collected some posts on those ancient Babylonian Aramaic incantation bowls here. This article is interesting because it tells about the unusual self-publishing route by which she started publishing her novels. If I knew that before, I had forgotten, and I'm pretty sure I've never highlighted it. Many aspiring authors might have given up at this point. Not Anton. Hiring a literary shepherd, she and her husband, Dave Parkhurst, a patent attorney, became publishers themselves. “I knew how to reach Jewish women, and I knew there was interest. I did a lot of cold calling of [synagogue] sisterhoods, Hadassahs and National Councils of Jewish Women chapters. Then I went all over the country and Canada and hit the Jewish talk circuit — sold books in the back of the room. They would tell their friends. There was buzz.” In 18 months, 26,000 books had sold. Then the big publishers started a bidding war over her. ENOCH WAS NOT JUST FOR THE SECOND TEMPLE ERA: Enochian: The Mysterious Lost Language of Angels (Bryan Hilliard, Ancient Origins). In the year 1581, occultists John Dee and Edward Kelley, claimed to have received communications from angels, who provided them with the foundations of a language with which to communicate with ‘the other side’. This ‘angelic’ language contained its own alphabet, grammar and syntax, which they wrote down in journals. The new language was called "Enochian" and comes from John Dee's assertion that the Biblical Patriarch Enoch had been the last human to know the language. The essays in Ancient Origins have been of mixed quality lately, but this one is a good summary of the story of John Dee, his "scryer" Edward Kelley, and their angelic revelations, which included the "Angelic" (later "Enochian") language; and also a good overview of the current state of the question in scholarship and among practicing magicians. Nice photos too. Dee's massive diary of his angelic séances has been useful in my own work on ancient revelatory praxis and experience (see my 2012 SBL paper here). And I have more on John Dee etc. here and links. DISASTER: ISIS Fighters Seize Control of Syrian City of Palmyra, and Ancient Ruins (Anne Barnard and Hwaida Saad, NYT). BEIRUT, Lebanon — Islamic State militants swept into the historic desert city of Palmyra in central Syria on Wednesday, and by evening were in control of it, residents and the Syrian state news media said, a victory that gives them another strategically important prize five days after the group seized the Iraqi city of Ramadi. As they have swept across Syria and Iraq, Islamic State fighters have destroyed or damaged numerous ancient sites and sculptures, condemning them as idolatry in slickly produced recruitment films, even as they pillage and sell off more portable items to finance their activities. That has raised fears both locally and internationally that Palmyra, a United Nations world heritage site, could also be irrevocably damaged. At the same time, he lamented that more attention had been focused on the threat to the city’s ruins than to its residents. Islamic State fighters massacred captured soldiers and civilians in outlying villages last week, according to Mr. [Khaled] Homsi [a Palmyra resident and anti-government activist] and a government soldier whose comrades were killed. And Mr. Homsi said several civilians had been killed by government shelling in Palmyra, unable to get treatment at the hospital, which was being used solely for military casualties. The AP/AFP has reports from locals indicating that as of this morning ISIS has not damaged the site. To surrender Palmyra is to betray civilisation itself (Boris Johnson, Daily Telegraph/Time Live). For some historical background on Palmyra, see here and links. And another post on recent events here. YONA SABAR: Hebrew word of the week: avaTiyyiaH: אבטיח. EXCAVATION: Section of Ancient Jerusalem’s Lower Aqueduct Discovered (Tzvi Ben-Gedalyahu, Jewish Press). A section of Jerusalem’s Lower Aqueduct, which conveyed water to the city more than 2,000 years ago, was exposed during the construction install a modern sewer system for Arabs in the villages of Umm Tuba and Sur Bahar, near HaHoma in southern Jerusalem. The Israel Antiquities Authority conducted an archaeological excavation there following the discovery of the aqueduct. INTERVIEW: Homeland creator Gideon Raff talks Dig (Michael Idato, Sydney Morning Herald). The series was created by Heroes writer Tim Kring and Homeland writer Gideon Raff, and while both may pour a sense of cinematic adventure into the framework, there is no doubt Raff's upbringing in Israel and his personal connection to the city play a big role in setting the series tone and texture. "I wanted to tell a story about the city, but of course I am a fan of Indiana Jones," he says. "I grew up on those movies and I love archaeology, [the idea of the] archaeological thriller, but more than anything I think I wanted it to be timely. I wanted it to be relevant like my other shows. "It was important, Raff says, that the series strike "a core in terms of the nowadays, the threats today and in that sense, Tim and I really wanted to make a show about fanaticism and faith. Everything I researched, everything unveiled in the conspiracy in Dig is real things that are happening right now, and in that sense it's a very relevant and timely thriller." REMNANT OF GIANTS: Illustrating The Benefits of Pentateuchal Literary Criticism: The David and Goliath Story. This is indeed a really striking case of where source critism not only works, but it can be established by a manuscript tradition that leaves out one of the sources. I just found out that Remnant of Giants is back and I will have to catch up on it. Gregorio del Olmo Lete, Incantations and Anti-Witchcraft Texts from Ugarit. Studies in Ancient Near Eastern Records (SANER), 4. Boston; Berlin: De Gruyter, 2014. Pp. vii, 254, 23 p. of plates. ISBN 9781614516279. €99.95. The remains of Ugaritic literature furnish a rich source for understanding the small but influential Mediterranean village of Ugarit in the late second millennium B.C.E. While one may think immediately of the colorful mythological narratives or even the cultic texts in this regard,1 del Olmo Lete tackles here the less well understood issue of magic at Ugarit. A comprehensive study of anti-witchcraft literature from Ugarit, both in narrative settings and in stand alone rituals, forms the primary basis for del Olmo Lete’s approach to the topic. del Olmo Lete presents transliterations, translations, and discussions of nearly all anti-witchcraft incantations uncovered at Ugarit. This includes texts in the native Ugaritic language as well as Mesopotamian texts in the Akkadian and Sumerian languages (the Mesopotamian texts were prepared by Ignacio Márquez Rowe and receive less discussion than the Ugaritic ones). Incidentally, in answer to a question in the review, del Olmo Lete did not use the Arslan Tash amulet inscriptions because he thinks (along with many but not all Northwest Semitic epigraphers) that they are forgeries. BIBLE TRANSLATOR: Tinkering With the Word of God (Avi Steinberg, The New Yorker). [Everett] Fox has dedicated his life to giving the Anglophone ear a hint of that Hebrew drama. Many translators have tried, in one way or another, to make the Bible do in English what it does in Hebrew, but few have given top priority to the sound and feel of the original language. Fox uses every poetic means at his disposal: phrase length, line break, puns. He has paid particular attention to the word repetitions that the Biblical narrator uses to develop the story’s themes. He scrupulously preserves ancient Hebrew’s doubled verbs, which themselves sometimes double up (“you will overtake, yes, overtake, and will rescue, yes, rescue”). Orality is key to understanding the story, Fox believes, because the Bible, like many ancient texts, was designed to be sung and performed aloud. For Fox, the standard continues to be musical performance, with its openness to interpretation. His translations of the Pentateuch and the Deuteronomistic History have been published so far. STILL IN PERIL: ISIS Attacks Druze Village, Aims for 'Victory Against the World.' Islamic State attacks Syria's Druze heartland before being forced out by pro-regime militia; clashes continue at ancient city of Palmyra. (Arutz Sheva). Further north, fighting between IS jihadists and government forces continued outside Palmyra on Tuesday morning. "There are clashes at the western entrance of Palmyra this morning, which lies on the road that leads to Homs city," provincial governor Talal Barazi told AFP. On Sunday, regime forces pushed ISIS out of northern neighborhoods of Palmyra, which it had held for less than 24 hours. Barazi said he visited Palmyra on Monday, "going through 60 percent of the city on foot," visiting the vegetable market and museum. He said at least 40 rockets had struck Palmyra on Sunday, but that government forces maintained control over key points, including the Islamic citadel overlooking the city. TEMPLE MOUNT WATCH: Israel’s 5-Year Upgrade Plan for Western Wall. Israel's new government has approved a five-year plan to upgrade and develop the area around the Western Wall (Hana Levi Julian, Jewish Press). Israel plans to develop the area with upgraded infrastructure, improved archaeological activity and, further development of the Western Wall site, and underground tunnels that run along the length of the Wall. THIS WEEK'S DAF YOMI COLUMN BY ADAM KIRSCH IN TABLET: For Jewish Widows, Like Modern Drug Offenders, Just How Much Matters. Why Talmudic law is precise, and how practical matters can test the moral foundations of the system. The amount of attention that the Talmud devotes to the rights of widows in Tractate Ketubot is a direct reflection of their vulnerability in a patriarchal society. As a daughter, a Jewish woman is under the protection of her father; as a wife, she is under the protection of her husband; but as a widow, she is suddenly left to fend for herself. Some women might have felt this as a liberation, but it was also a position of economic and social peril. How is she to make sure that her husband’s heirs—who might not be her own children, but any of his relatives—will treat her fairly? What if they throw her out of her house? What if they refuse to give her money to live on? MODERN ARAMAIC WATCH: The Plight of the Middle East's Christians (Walter Russell Mead, WSJ, reprinted by AINA). The numbers are stark. Almost 1.5 million Christians lived in Iraq under Saddam Hussein. Between the U.S.-led invasion that toppled his regime in 2003 and the rise of Islamic State, three-fourths of the country's Christians are believed to have fled Iraq or died in sectarian conflict. The carnage continues. Of the 300,000 Christians remaining in 2014, some 125,000 have been driven from their homes within the past year, according to a March report on "60 Minutes." A long, informative article. The media are not ignoring this situation, or I would not have articles to link to like the one above. But at the same time there is not the outrage in the West that one routinely finds for much less momentous problems happening to Westerners. This is unfortunate. Related article: An Assyrian Woman's Struggle for Her People's Future (Diana Darke, www.alaraby.co.uk, reprinted by AINA). A Syriac [Assyrian] Christian woman is challenging sexual and religious discrimination in conservative southeastern Turkey and building bridges with her co-religionists fleeing persecution at the hands of the Islamic State group in Syria. In the southeastern Turkish municipality of Mardin, the 26 year-old co-mayor, Februniye Akyol, is a local girl from the Syriac Christian minority. Despite the nearby border with Syria having existed for nearly a century, those in her Syriac community retain close ties with family members on the other side. Never had she envisaged a political career. As the first local Syriac Christian woman to leave her home and go to university in Istanbul, everyone assumed she would use her education as an escape route to Europe, like many Syriac graduates before her. Instead Februniye returned and began an MA at Mardin's Artuklu University in Syriac cultural studies, the only such course on offer in Turkey. Then, with only two months to go until local elections scheduled for 30 March 2014, Abdullah Ocalan, the imprisoned leader of the Kurdistan Workers' Party (PKK), made the radical suggestion that a Syriac woman should run for co-mayor alongside Ahmet Turk, the respected 72 year-old Kurdish candidate. I have been following the Syriac Studies program at Mardin's Artuklu University since it was announced in 2009. See here and follow the links. It sounds as though it has been pretty successful. Recent posts on modern Aramaic-speaking Christians and their current persecution in the Middle East are here, here, and here, with many links. UPDATE: UNESCO calls for Palmyra protection as ISIL withdraws from city (Alexander Aucott, Euronews.com). UNESCO has said the historic city of Palymra in Syria must be protected. The call comes after intense fighting between forces loyal to President Assad and ISIL militants already caused some damage. The militants reportedly withdrew from the site on Sunday after seizing it a day earlier. The reports are conflicting on whether ISIS actually seized the site or only got close to it. I hope the latter. In any case, they have been repelled for now. Related, a photo gallery: Palmyra - An oasis of cultural history (Deutche Welle). Palmyra was an important ancient Aramaic-speaking city. Some historical details are given here and information on Palmyrene Aramaic is collected here. And for these and more posts on Palmyra and on the recent threats to its ruins, start here and follow the links. Cross-file under Aramaic Watch. R.P. NETTELHORST: SYRIAC (Through a Glass Darkly, Jerusalem Post). As part of my graduate program at UCLA I was required to learn several dialects of Aramaic, including Syriac. Since that time, I had not done much work with the language. However, one summer a few years ago I was approached by an old Orthodox priest and one of his deacons. They asked me if I could offer a class in Syriac, since their church uses the language in its liturgy, but they didn’t even know the alphabet and had to do the liturgy each Sunday by reading it in transliteration. A rambling essay on the Syriac language and its long history up to the present. Cross-file under, you guessed it, Syriac Watch. A PRE-PRINT FROM ALIN SUCIU: On a Bilingual Copto-Arabic Manuscript of 4 Ezra and the Reception of This Pseudepigraphon in Coptic Literature (forthcoming in Journal for the Study of the Pseudepigrapha). 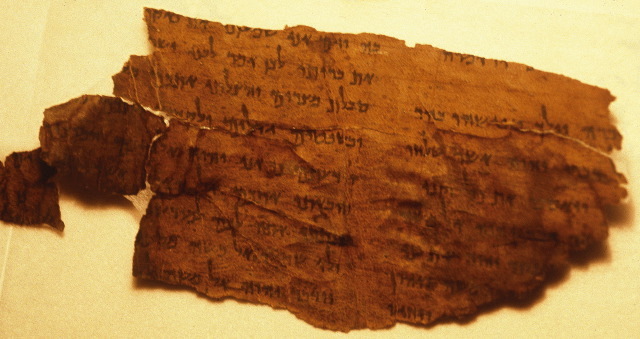 The text of 4 Ezra has survived in many ancient languages. Among these, the Sahidic Coptic version is the most poorly attested. The focus here is to introduce a new Sahidic fragment of this Jewish pseudepigraphon, which is preserved in a bilingual Copto-Arabic manuscript from the Monastery of Apa Shenoute. This hitherto unknown fragment is datable to the late fourteenth or early fifteenth century. The article provides an edition of the newly identified fragment, together with a paleographical description, an analysis of the text, and a survey of the relevant sources pertaining to the reception of 4 Ezra in Coptic and Copto-Arabic literature. Alin shared the article with me last year. I am pleased to see that it is now available online. At the University of Munich, Forness will research Syriac, Arabic, and Ethiopic languages and cultures in Late Antiquity and the Middle Ages. His project will focus on Thomas the Apostle. FOR JERUSALEM DAY (YESTERDAY): Why is Jerusalem called Jerusalem? From its earliest name Ursalim, Jerusalem's name has mirrored the city's conquerors, passing through Jebus to the Roman Aelia Capitolina to al-Quds - and back to the ancient Israelite Yerushalayim. (Elon Gilad, Haaretz). A good, accurate account of the names of the city from antiquity to the present. One small correction: Arabic and Ethiopic are South Semitic, not West Semitic. The author was perhaps thinking of Proto-Semitic, which is ancestral to all the Semitic languages. JUST LIKE THAT: 1,400-Year-Old Wine Press Mysteriously Appears in Jerusalem (Michael Zeff, Tazpit News Agency/Jewish Press). The mystery kept bothering IAA officials, until the IAA team who took over maintenance of the site discovered that the ancient wine press had been discovered and excavated by local children. The neighborhood kids, it appears, are avid archaeology fans and at first were simply “playing pretend” in the forest surrounding the neighborhood, until their game turned into reality. There are additional details in this premium Haaretz article by Ruth Schuster: Boy digs up 1,400-year old wine press in Jerusalem. A jogger stumbled upon an unmarked dig and smelled a rat – which turned out to be an unkosher archaeological dig of wine press from the 6-7 century ADE (sic). Keeping a close eye on the site paid off: lo and behold, shortly the inspectors noticed a Haredi boy of "bat mitzvah age" – around 13 – loitering by the site. Not just loitering: he was watching closely. "Before we could even ask what he was doing there, the boy ran up and openly and proudly told us that he and his friends were archaeology buffs and had done this excavation," says Amit Ram, the IAA archaeologist in charge of the Jerusalem district. It bears saying that unauthorized digs are against the law in Israel, pure and simple. "On the one hand it's a crime," Ram told Haaretz. "On the other hand I realized it was done in innocence, and I was touched to the core by the boy's story – which reminded me of my boyhood, at age 12 or 13. We suggested that the boy and their friends channel their energies to works for the community," he said. The IAA does beg to point out however that unprofessional archaeological mucking about can lead to the loss of precious information and citizens uncovering some historic find should contact it. As for teenagers with archaeological interests, they can indeed participate in digs – coordinated with the IAA, which suggests they get in touch through its website. SAFE FOR NOW: Syrian army pushes back Islamists from ancient Palmyra. World Heritage Site rocked by fighting between Islamic State and forces loyal to the government; 76 reported killed (AFP). But ISIS got to within a kilometer of the site. ANCIENT ORIGINS: The Golem: Talmudic Legend of a Clay Beast Created to Protect the Jews (Ḏḥwty). Interesting post that seems more or less accurate, but suffers from the lack of primary references. If you are going to write about ancient texts, always include specific references so people can look the passages up themselves. A very old Philologos column on the Golem legend is noted here. The link has rotted but the excerpt is informative and at least gives general references. For many more Golem posts, see here and links. BIBLIOGRAPHICA IRANICA: Ancient World Digital Library (AWDL). An important collection of digitized secondary literature from the Institute for the Study of the Ancient World at New York University. ANCIENT JEW REVIEW: Breed, Nomadic Text: A Theory of Biblical Reception History (Krista Dalton). ... Readers may differ with Breed about the mutual exclusivity of his approach and standard reading practices of the Bible and also may be left wanting a lengthier illustration of method than 3 verses from Job. Nevertheless, Nomadic Text offers an innovative poststructuralist theory of textual reception that dismantles the typical tools of textual work in order to deflate the prestige of the “original” and instead consider nomadic potential. I haven't read the book, but the review does make it sound as if its approach goes too far in dismissing attempts to get at something resembling an "original" text or meaning. Such things are unattainable ideals, but are still worth trying to approximate as one aspect of the scholarly study of ancient texts. LIV INGEBORG LIED: Updated program: Studying Ancient Magic: Categorisation - Comparison - Materiality. Background here.